The story of my relationship with Maya started in one spring when I needed to create something special with my own hands. Maya was born from flour and water and grown as my pet in a jar. And it's not an animal or a plant, is just a bacteria ... well please don't laugh, every one with his own pet. Indeed I am talking here about Maya who is a white sourdough that I use currently in my breads. I called her Maya because the name sounds exactly as the sourdough word translated in Romanian. I remember when I started making bread with the bread machine at home people looked askance at me ... Who is making bread at home nowadays when it's so easy to buy from the corner shop? In a society of consumerism when all food come ready-made, who would bother and waste his time with these things? In case you haven't realized until now, I am that person. Not only that I have started to make my own bread in the bread machine at home some years ago but lately I've started doing sourdough leavened bread. Perhaps some people think that I have nothing else to do but I can say that the bread you make with your hands doesn't compare with the one brought from the corner store. You simply cannot compare the taste of the old country bread leavened with sourdough with the taste of paper that the commercial bread has. You cannot compare a bread made with only the three basic ingredients (flour, water and salt) by the commercial one made with tens of unhealthy ingredients just to increase production and fill the pockets of business owners. And last but not least, nothing compares to the satisfaction that you get when you see how your dough is raising when fermenting or when you put it in the oven. For these reasons, Maya was born. It would have been much easier for me to take a teaspoon of yeast from someone and to maintain it. I asked around my friend, my relatives and all they thought about how their grandparents were making bread but no one had some sourdough to give me. Others have remembered some dried dough that their grandparents (a kind of dry sourdough) were making but it was not the same thing. I searched the internet to buy and found some sites but not really convincing for me. So, I asked myself if I am not able to do the sourdough myself. I started this little project, and I succeeded! And this is how Maya was born. Day 1: In the evening, put in a clean jar 50g rye flour + 50g bread flour + 100 ml warm water (about 25ºC), mix ingredients well, put the lid on the jar without screw it and place it in a warm place in the house. Each house has such a place, like on the refrigerator, on or behind TV/computer. I have found the perfect place on the router that my husband keeps on his desk. And I said a warm not hot place, so avoid being put on the radiator or in the sun because starting from 38ºC you bake it instead of raising it. I put the rubber band outside the jar at the level of the dough to see how much is increasing. What's in the jar is not yet sourdough, at most one can call it culture. Day 2: Next evening, put in the jar 75g culture + 75g water + 50g bread flour + 25g rye flour. Excess sourdough (ie 225g - 75g used = 150g) can be stored in the refrigerator for up to a week and you can use it in addition to other recipes for bread, pancakes, pizza etc. Day 3-8: In the morning of the 3rd day I have noticed an increase of 200%. Do not get too excited because your sourdough is not ready yet. There are many bacteria that grow now but is not the one you are looking for. This level of increase you will not see in the next few days, just weak signs of growth. However, check if the culture makes bubbles. From this point when you get your first 200% increase, continue with feeding it twice a day, morning and evening with quantities 75g culture + 75g water + 50g bread flour + 25g rye flour. In the next days, growth will not be as dramatic because the other bacteria will die and in the end the one you are searching for will remain. You need a bit of perseverance and trust that if you feed it conscientiously and keep it under optimal conditions it will start raising. In my case, on the 3rd day after the evening feeding, the volume increased by 40%; on the 4th day, it was 50% and 50% after morning and evening feeding; on the 5th day, 40% and 30%; on the 6th day, 40% and 40%; on the 7th day, 30% and 80%, and in the 8th day, 200% and 300%. And YESSSS, I had sourdough starter! When after a feeding, you get the culture doubled in 12 hours you know that you have born your own sourdough. The percentage of growth obviously depends on the temperature where your jar with culture is kept. Do not rush the process by keeping it at 30°C because the ideal temperature is around 24ºC. Day 9-16: If you have obtained a double size of culture, you can call it sourdough. And if you like the idea baptized it! However, to ensure that your sourdough is working, continue to feed it in the morning and evening for another 1-2 weeks before using it as you main raising ingredient. And once it become mature you can keep in the refrigerator as described below. Sometimes, to make it doubling in size it takes more than 8 days days. Go up to maximum 15 days and if it doesn't double in size by then throw it away and start all over again. Since doubling in size, you can forget the rye flour and feed it with only white flour. Feeding will be 75g sourdough + 75g water (at room temperature) + 75g flour every morning and evening. Later, you can reduce the amount from 75:75:75g to 15:15:15g. After the new sourdough passed its teenage, 16 days to say, try a bread with it. When the sourdough is unfed, it smells sour and this is very normal. In the fermentation process it releases alcohol. When you keep the sourdough unfed for longer you'll notice on the surface a layer of transparent brown liquid that is nothing else but alcohol. When the sourdough is fed the dough has a pleasant smell, not pungent. What happens to the excess of sourdough? Well, what would you want to do with it? To throw away? Sure you can, but preferably not in the sink because flour sticks to the pipes and I doubt you would like to call your plumber soon. Preferably, pour it in your compost bin. Personally I do not like to throw it away, so I store it in the refrigerator in a large jar marked with the label Sourdough excess. And all this excess goes in another recipe. And I have dozens of recipes in which to pitch the sourdough ... Anyway, for healthy reasons, do not store this sourdough for more than a month. You use it or discard it. The good thing with this extra sourdough is that you always have a reserve in case of any damage. How it would be to realize that your husband wanted to help you a bit in the kitchen and cleaned well your jar with your precious sourdough or your little child dropped the jar by mistake and broke it? 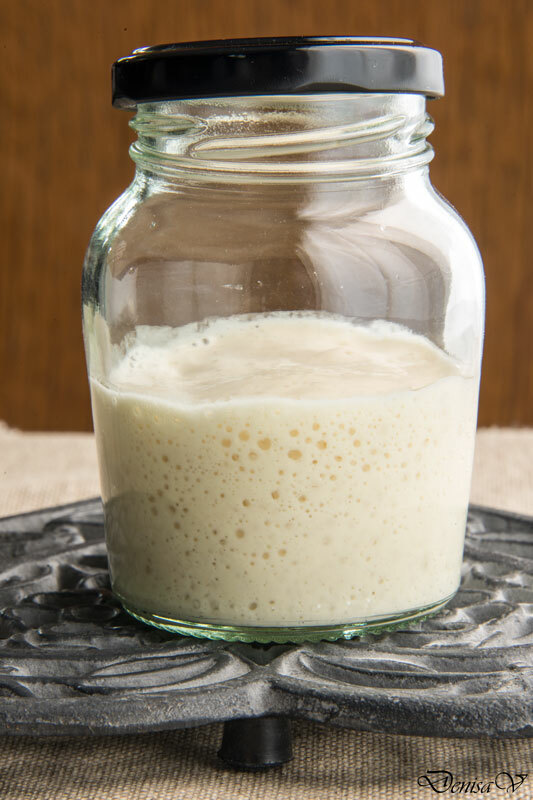 If kept at room temperature the sourdough needs to be fed every 12 hours, meaning every morning and evening if you do not want to wake up in the middle of the night just to give food to your sourdough starter. However, I do not like to become a slave of my sourdough and have an extra worry twice a day. Especially because I am not a "morning person", I prefer to reduce my morning activities to the strictly needed ones and not to be stressed to do an extra thing. Then, generally I make 1-2 loaves a week so I prefer to use the next option listed bellow. If you use it once a week to bake bread, keep it in the refrigerator and take it out at room temperature 24 hours before using it. For example, if I make a bread that requires preferment made Friday evening, I take out the sourdough from the refrigerator on Thursday evening, feed it on Thursday evening and on Friday morning. On Friday evening, I use a part of the sourdough for the preferment, a part goes back in a new jar to be fed and the remaining goes in the Excess sourdough jar. I'm not a fan of putting aside a quantity from the bread preferment because for sure one day I'll forgot to do this and then my precious sourdough is gone. So I prefer to keep separately the mother sourdough starter, feed it, leave it for another hour at room temperature then put it back in the fridge (in the example above, on Friday evening). In my case, having a normal daily job doesn't give me too many options but to bake breads mainly in weekends, so this is my optimal solution. If you make bread twice a week, follow the same principle and take out the sourdough from the fridge 24 hours before using it. If you leave home for 1-2 weeks, then leave it in the fridge. It will not die, it will preserve quietly. Or it can be given to a friend / neighbor to take care of it as I would do for my own pet. But when I return, I take more care of it, by taking it out from the fridge and keep it at room temperature for the next 5-6 feedings every 12 hours to return to its shape. I read on other blogs / sites that it can stay alive even 3-4 months in the refrigerator and then resuscitated with more care but I have not tested to keep it hungry for more than 2 weeks. If, however, you plan for a long-term departure then dry it and you can hydrate it in maximum 2 years. The sourdough can also be frozen for a period not exceeding 1 month otherwise is dying. For me this is not a practical solution so I prefer to keep it rather dried than frozen. Looks very interesting. One definitely needs a lot of patience, time and commitment. I hope I will have all those along with the other ingredients sometime in the coming year. Thanks for the recipe and Happy 2015! What is the formula for 166% hydration? Thank you very much for sharing this great recipe. At the moment, I am working on this recipe but I feel little bit confused what to do on day 2. As you mentioned, we do need 2 jars (Jar 1 + Jar 2). Day 1: I have done exactly what you show us in details. You meant the Jar 1 is just to make CULTURE only? Day 3-8: from now one are we working on Jar 2 only? Am I right? If yes, what should we do with Jar 1? will we put Jar 1 with all the culture in the refrigerator for next use? The formula for 166% hydration is simple: for each 100g of flour you put 166ml of water. You use 2 jars to switch the sourdough from one to another. It is easier this way for measuring it. While raising your sourdough in these 2 weeks, you should throw away the remaining part. When you'll have a stable sourdough you can reuse the discarded part to complement your bakings but not before. The point in feeding the flour and water for 2 weeks is to arrive to get the right bacteria in it. Untill then other bacteria may develop and is not indicated to reuse.